You'll Never Guess What Happened on This "Death Trap Escalator"! The family of a man who was strangled to death after his clothing became ensnared in an escalator has received a settlement of $1 million from King County, Washington. As the 42-year-old victim was nearing the bottom of an escalator at University Station, he fell and the drawstring on his hooded sweatshirt became caught in the moving steps, which caused the rest of his clothing to become trapped. Even though firefighters were ultimately able to free the man from his clothes, he tragically died at the scene because of the drawstring around his neck. Just 10 months before the man’s death, a Florida tourist suffered serious injuries to his foot after his shoe became ensnared – on the very same escalator. King County officials ignored the man’s complaint and request that the county cover his medical bills. In March 2014, a young boy was stuck – again, on the very same escalator – when his shoe became trapped. Thankfully, his mother was able to free him and the boy didn’t experience any injuries. “This escalator was really old, poorly maintained and kind of a death trap,” said the late victim’s attorney. Are Safety Devices That Failed to Engage to Blame? The incident involving the man’s death was captured by surveillance cameras. While the escalator has safety devices in place to detect items between the steps, the mechanisms never triggered. 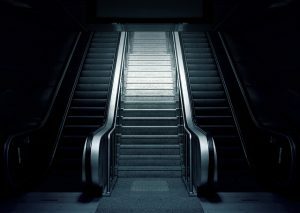 In fact, several of the escalator’s teeth were broken and its steps were proven to be misaligned. Even though a passer-by pressed the escalator’s manual stop button, the man was pinned too tightly to be pulled free. Did King County Fail to Upgrade? Attorneys representing the man’s family were able to prove that in 2001 a consultant hired by King County and Port of Seattle recommended that all escalators be modernized and fitted with step-comb impact devices. The $1 million payment will be handled by King County. The amount to be paid by KONE Elevators & Escalators, the company responsible for the escalator’s maintenance, remains confidential. This story is tragic on so many levels. A logical person would assume that after multiple injuries, the escalator would have been upgraded. If you’ve been injured because of someone else, Barber & Associates can help you understand your rights. The first consultation is always free, so call us at 800-478-5858 or send an email.